Can you imagine your life without vision? Here at the Brentwood Eye Clinic, we believe your vision is precious. Our doctors strive to give you the crisp, clear, vibrant vision you deserve. We provide a comprehensive optometric experience including eye exams with our state of the art equipment, contact lens fitting, and a huge selection of quality designer frames to fit any taste. The Brentwood Eye Clinic has been located in northwest Calgary since 1993. Let us put our experience to work for you. Alberta Health Care covers eye exams for children until their 19th birthday! Alberta Health Care covers eye exams for seniors after your 65th birthday! Alberta Health Care covers medically related eye exams (eye infections, monitoring for diabetic retinopathy, etc.) for all ages! We can also submit to Sun Life on your behalf. Just bring in your card and we will take care of the rest. 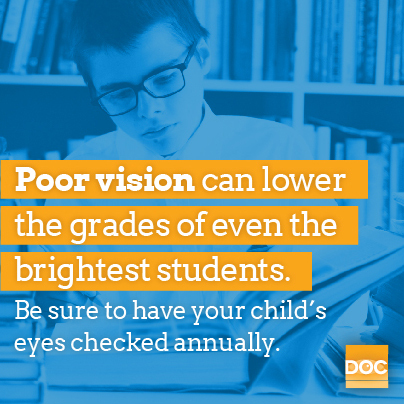 Why is my child nearsighted?